If a wig is too big and you want to make it smaller, you can take it in, similar to the concept of taking in a dress. First, you will want to find out how much to remove. Put it on you head and pinch it to see how many rows need to be taken out. Then take it off and turn in inside out. You will want to remove rows that are just under the ear tabs, not above them. It is too hard to made the sides match up if you go too high. Snip the elastic between the row all the way across.Snip near the center so you have some elastic left on each side. By cutting it out as in the previous step, you will thin the amount of hair volume slightly. You may want that. If not, another option is to take a few tucks instead of cutting the wefts. 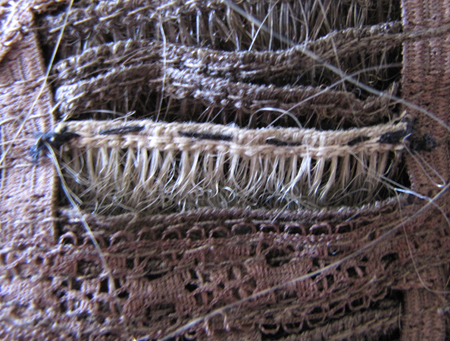 You will sew it down the same as in the next step, but the weft will still be attached underneath. This will keep the same amount of hair in the wig. However, there is more sewing involved since you may need to take more than one tuck. Once you have the rows removed, position the two sections back together where the rows have been taken out. Make sure you match each up with the same row. Pin in place. You can try it back on and see if this is a good fit. If it is still too large, you may want to take out another row or add a tuck. Now you just need to sew them together. It doesn't have to look pretty since your sewing won't show. If it is too wide, you can overlap it a sideways and take a tuck. 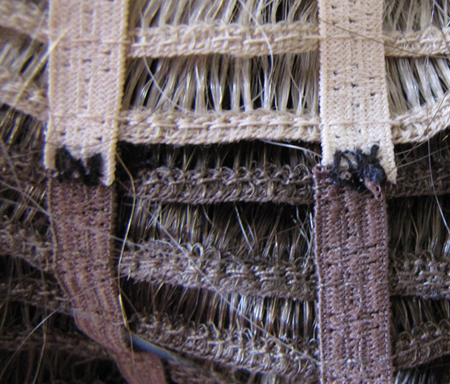 We do not recommend cutting the wefts off of the elastic because the stitching goes across and will come undone. It is better to just take a tuck. This is more time consuming, however. Usually the previous step will be enough to make the wig fit flatter to your head. Have you ever really liked a the style of a wig but wished it had a few highlights? Having a custom wig made can be expensive, so here is a way to add a few highlights yourself. You will need some hair that is the color you want the highlight. You can either purchase a second wig in the highlight color (the best idea since the length and curl pattern will be exactly the same) or use an old wig you no longer wear, or purchase some highlights or a weft that is used for extension hair. 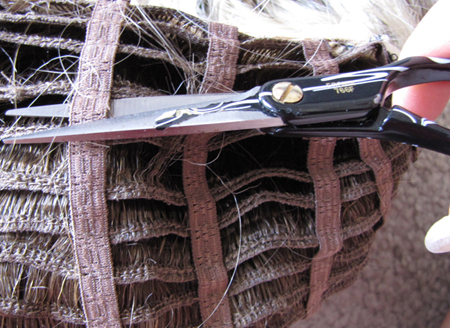 Cut a piece of weft the width of the highlight. 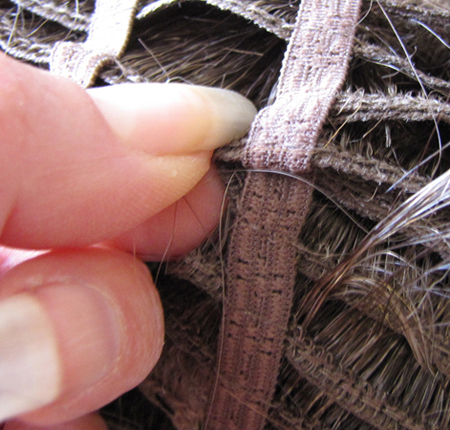 Then place it exactly on top of an existing weft in your wig. Baste it onto the existing weft and sew side edges to the elastic.